Drink-driving and drinking while pregnant are socially unacceptable in many countries, yet when it comes to other alcohol-related health risks, public awareness is low. Globally around 3.3m people die from causes directly related to alcohol consumption – the top ones being heart disease, cancer, liver disease and accidents. However, a 2016 survey of 2,100 adults in the UK found that just 13% of respondents identified cancer as a potential health risk of alcohol consumption. It seems that the alcohol industry and governments aren't too bothered about changing this. In fact, mandatory health warnings for alcohol are rare. Across the EU, which boasts the highest per capita alcohol consumption in the world, there is no legislation requiring health warnings. We know that the most effective strategies to change behaviour and reduce alcohol consumption are legislative. These include raising taxes, minimum unit pricing and lower drink-drive limits. But the alcohol industry lobbies hard against interventions that threaten profits, and most governments seem to defer to the industry's preferred alternative of self-regulation. The industry and governments don't seem that keen on health warning labels either. One argument is that health messages don't change behaviour or that drinkers don't want to have their pleasure spoiled by uncomfortable truths. And it's true that information in isolation of other public health and health promotion strategies may be of limited value. But when it comes to motivating behaviour change, it can be helpful to raise awareness and challenge people's beliefs about their behaviour. Health messages, if done well, could raise awareness and for some people might be the switch that gets them thinking about drinking less. Providing accurate information can also help to counter common myths and misunderstandings. For example, ambiguity about the potential health benefits of moderate drinking can be the "excuse" we need to resist changing our behaviour. On the other hand, it is important to acknowledge evidence that health messages that try to induce fear often backfire – images of diseased lungs on cigarette packaging, being a case in point. Smokers don't want to be confronted by the negative consequences of their behaviour and they may smoke more to deal with the discomfort experienced. The same is likely to be true of alcohol health warnings. For the latest Global Drug Survey (GDS2018) – a survey of 130,000 people from more than 40 countries – we explored the potential of seven different health messages to change people's drinking habits. We chose a variety of health and social issues to focus on and used a mixture of positive messages, highlighting the benefits of reducing consumption, and negative messages, highlighting risks. 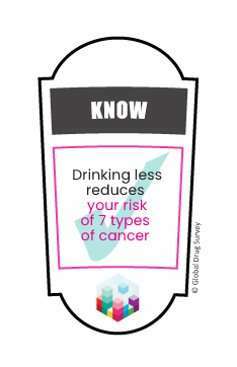 The results show that cancer remains the area that people least associate with alcohol use, and a message such as "drinking less can reduce your risk of seven different types of cancer" could get almost 40% of drinkers to think about drinking less. The top two other messages that people reported would make them – or maybe make them – think about drinking less were: "Even people with heavy alcohol use can reduce their risk of liver disease by cutting down by even a small amount" (31%), and a label highlighting that a bottle of wine or six small beers has the same number of calories as a hamburger and fries (28%). Our study also shows that different cultures may be more or less responsive to health warning labels, with Scandinavian countries, which certainly have high rates of alcohol-related harms, seemingly less concerned than those from South America and the Mediterranean. 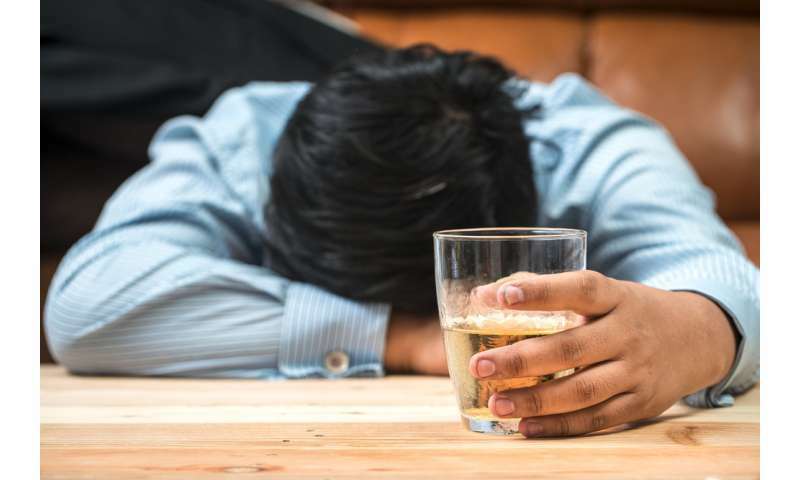 Of particular interest was the relatively high rate of disbelief of the statement: "Most people get little or no health benefit from alcohol use, even at low levels of drinking". The subtle message that a little alcohol is good for your health is one the alcohol industry is fiercely protective of, and our results show that more work is required to diminish this falsehood. Conversely, the label stating that alcohol increases the rate of violence and abuse was the one that was believed most by participants. Globally, this was also rated as the most personally relevant label, closely followed by those about calories and the benefits of having two days off. This perhaps reflects that people are more concerned about the immediate effects of drinking. Again, there were regional variations; our findings suggest that countries in South America and Eastern Europe may be more affected by the social impact of alcohol than other countries. Consumers of alcohol, like any other drug, need to be given the facts about the risks they expose themselves to when they drink. 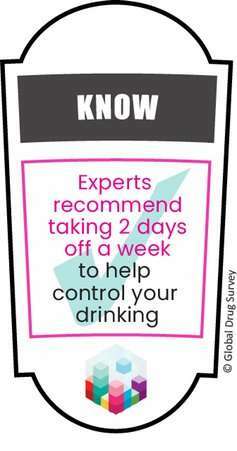 They need to know that risk is dependent on how much they drink and that drinking less reduces that risk. They need specific positive messages that allow people to feel OK about making decisions that may improve their health and well-being. In the same way that plain packaging and health warnings on tobacco products were used as part of a broader public health approach to reducing consumption, appropriate and proportionate health messages on alcohol should be explored as a cheap, easy-to-implement strategy that could raise awareness of alcohol-related harms. The latest Global Drug Survey supports the call for mandatory health warning labels on alcohol. An industry that makes profits from selling a product will never embrace anything that might lead to people drinking less. A self-regulated industry will always regulate to optimise profits not public health.